Images from a hidden world of dreams and nightmares form this unique line of edged fantasy creations. This designs is strikingly beautiful, some wickedly haunting, and some defy conventional description. This edition is from the very popular Valdris designed & fantasy Kinfe. 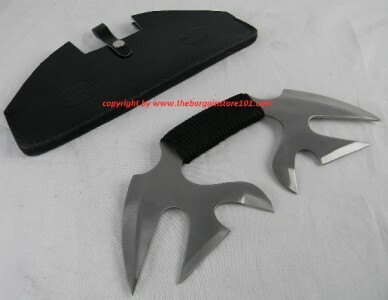 Features include a highly detailed full tang handle with a nylon wrap gripping and the 440 stainless steel blades. Thanks for looking and if you have any questions please feel free to e-mail us. Free Shipping to the lower 48 US states only! !